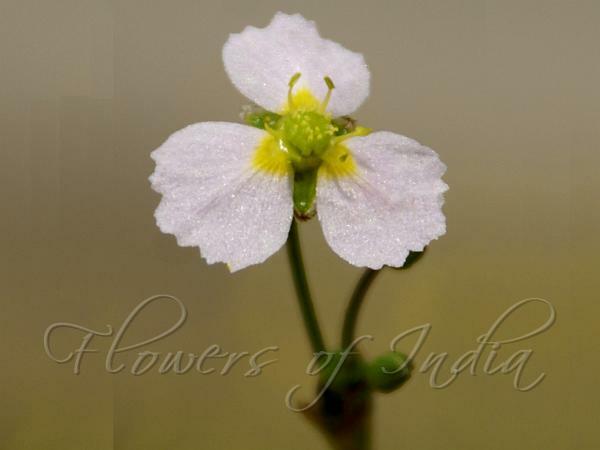 Common Water-plantain is a perennial flowering plant native to most of the Northern Hemisphere, in Europe, northern Asia, and North America. It is found on mud or in fresh waters. It is a hairless plant that grows in shallow water, consists of a fibrous root, several basal long stemmed leaves 15-30 cm long, and a triangular stem up to 1 m tall. Leaves are ovate-lanceshaped or ovate, rounded or heart-shaped at base. It has branched inflorescence bearing numerous small flowers, 1 cm across, with three round or slightly jagged, white or pale purple, petals. The flowers open in the afternoon. Flowers have 3 blunt green sepals, and 6 stamens. The carpels often exist as a flat single whorl. Flowering: June-August. Medicinal uses: It is a Chinese medicinal herb used for edema, diarrhea, strangury, vaginal discharge, dizziness, painful urination, seminal emission, nightsweating, lumbar pain. 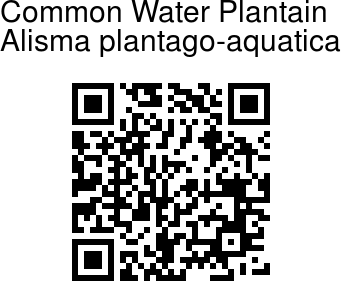 The dried leaves of the water plantain can be used as both a diuretic and a diaphoretic. They have been used to help treat renal calculus, cystitis, dysentery and epilepsy. The roots have formerly been used to cure hydrophobia, and have a reputation in America of curing rattlesnake bites. However this is not proven.